The purpose of our trip to Stratford-upon-Avon was for the Cubs to take a tour on a motor cruiser along the River Avon to complete their ‘Time on Water’ staged Activity Badge. Ten Cubs and four Leaders met at Banbury Railway Station on Saturday morning to catch the 10.24 Chiltern train to Stratford-upon-Avon town station. The train was on time and we had an uneventful journey. Once at Stratford-upon-Avon, we walked the Cubs from the station to the river, a walk of about 20 minutes. On arrival at the river, we were able to watch the boat we were going to go on after lunch make its way from the canal basin through the historic canal lock on to the River Avon. First things first though! 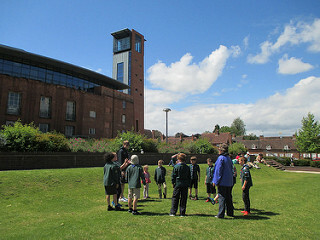 We found a nice spacious grassy area in front of the Royal Shakespeare Theatre where we were able to eat our packed lunches then play a couple of ball catching games before it was time to queue up for our boat. Our boat was called the ‘Jennifer May’, owned by Canal and River Tours, and was chosen as it is the only boat that starts in the canal basin and goes through the lock on to the river. The Company had been very helpful with pre-visit information and had allowed us to pre book our seats on the boat. The boat was very comfortable with large all round windows which gave us wonderful views during our 45 minute trip. There was a very informative commentary to listen to with a fun quiz to complete based on the commentary. After our trip, it was time for an ice-cream stop before a short walk along the river to discuss the various crafts we could see on the river. We then took a short trip across the river via the Chain Ferry, built in 1937 and said to be the last of its kind in Britain. Soon it was time for the return walk back to the station where we caught our train back to Banbury, arriving at 16.29 to be greeted by all the parents. A very enjoyable and interesting day with all requirements of the ‘Time on Water’ completed.